It sounds like common sense, but not locking your doors just once is all it could take. 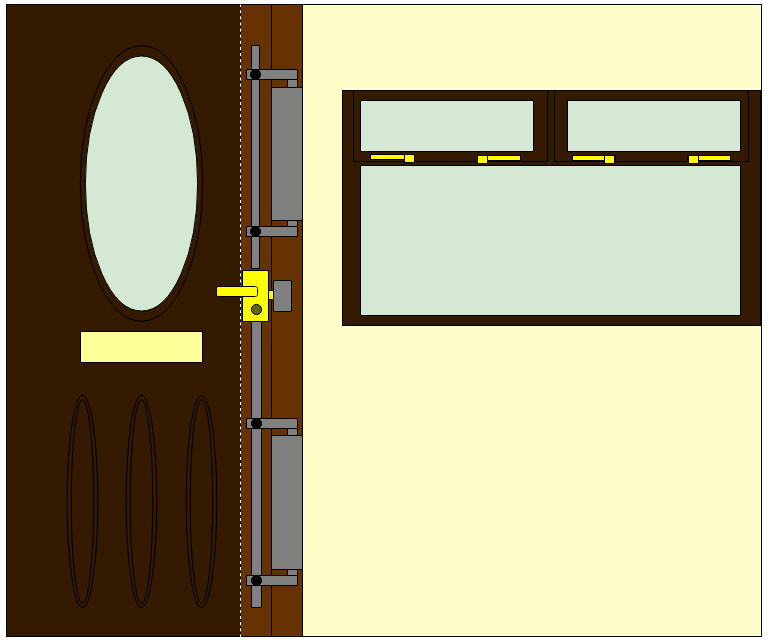 Make sure your doors and windows come with as comprehensive a set of locks as you can afford, as seen here, with the cut away part of the door showing the 5 locks inside the door put in place when you shut it. Making sure your house is well lit will deter many opportunistic burglars passing by your house at night. These can be motion activated, and can be fitted with panels, enabling them to run off of solar power, to minimise their effect on your electric bill. Syncing up your home to an alarm system can increase security without ever being set off. Contact points that raise the alarm when broken (see the devices on the door and window) and motion detecting scanners will be linked to a box on the outside, which will act as a clear sign to burglars that the house is alarmed and not worth the hassle. You can go the further mile to add to the visable-from-the-outside deterrents by adding security stickers to your windows. Ones that mention alarms or guard dogs will discourage those who have walked up to your house. A thief is likely to scope out a house through a window before stepping in. They’ll be looking for easy to swipe valuables, so make sure anything expensive or sentimental isn’t left on show when you are out of the house or in bed. To further aid in the shielding of your homes content, buy thick, heavy curtains, and draw them whenever you are out. Upstairs windows can be just as vulnerable as downstairs ones. Don’t make life easy for any would-be thief, and keep anything that could be used to scale your house locked away or chained up away from the property. Keeping neighbours you trust in the loop can be a valuable asset for when you are away from the property. If your street has one, join the Neighbourhood Watch scheme, and display the appropriate stickers. For those looking to not only save money but also recycle, use any used smart phones you have as re-jigged security cameras. Attach it to a mounting point, and install an app that allows you to view the camera feed. You need only turn it on when you are out or asleep. And finally, watch the video below to see the latest in smart technology for your locks.